Summary: This project will allow Friends of the Carr Refuge to purchase equipment for shared use by multi-agency partners for STSSN responses within Archie Carr NWR to safely remove injured and deceased sea turtles for rehabilitation, refrigeration for future necropsy, or disposal. The requested equipment will provide responders with efficient means of expediting injured turtles to rehabilitation centers. Alternate equipment requested will allow removal of deceased turtle remains from the Refuge beaches when on-site burial is not an option (i.e. nesting season). 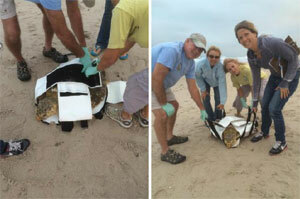 Results: On 6/26 two turtle rescue slings were ordered from Lakes Bay. On 8/11 four body bag stretchers were purchased from Medical Products Ltd. Since their purchase the small sling has been used at least 6 times with 3 live turtles and 3 carcasses; the large sling was used once for a carcass. The use of these tapered off after October due to the fact the carcasses could be buried on the beach outside of nesting season. Use is expected to increase again as we go into the next nesting season. The large body bag/stretchers were shared with nearby stranding agencies with one being kept by Friends of Carr Refuge and the other three going to Sea Turtle Preservation Society, Sebastian Inlet State Park, and Indian River Sea Turtle Team. They have not needed to be used as we have not encountered a stranded turtle large enough to warrant them yet; however, they were used for two dolphin strandings in the Refuge.